Churches are very similar to all buildings in that they need several types of fire protection. The type and amount of church fire protection needed to prevent a church fire in a church will depend on several factors. These factors include whether the church has computers, a kitchen with a commercial hood and exhaust system, audio and recording equipment, other electrical equipment, and the size and capacity of the church. Many churches start out very small and have a very small budget. But, fortunately most churches do not try to skimp on church fire protection services. All churches should have an adequate amount of up to date functional fire extinguishers of the appropriate type. The type of fire extinguisher most commonly found in a church will be ABC type fire extinguishers. It has been my experience that many churches start out using 5 pound fire extinguisher to get by. But, as a church grows, it pays to invest in placing 10 pound ABC fire extinguishers throughout the church. In addition to ABC fire type fire extinguishers, Churches will need to have at least one CO2 type fire extinguisher or Halon Fire extinguisher any and all locations where there is computer or electronic equipment. Electronic equipment includes amplifiers, video, and audio recording equipment as well as electrical rooms. This type of fire extinguisher extinguishes electrical fires without causing additional damage to the electrical equipment. In Churches that have a kitchen with a stove, fryer or other type of cooking device, there is a need for a k-class type fire extinguisher for proper church fire protection.. 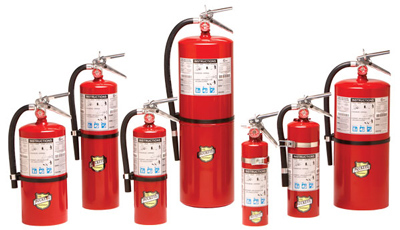 These types of fire extinguishers are specifically designed to extinguisher grease and cooking oil fires without causing a splash or “explosion” and without spreading the flames. If you have ever seen water placed in hot grease you will understand the need for this type of fire extinguisher. A k-class fire extinguisher contains and a specific kind of liquid that covers the burning area and cuts off the oxygen supply then suffocates the fire. All fire extinguishers are required to be serviced by a professional fire protection company at least on an annual basis. Churches that have kitchens and also have a commercial range hood also are required to have a fire suppression system within them. There are many different brands of kitchen fire suppression systems. Some fire suppression systems are better known than others but, all of them work in a very similar way. All fire suppression systems that are used commercially must be approved by Underwriters’ Laboratories (UL). So, regardless of the brand all commercial kitchen fire suppression systems have to have UL approval and are sold through professional fire protection companies. The fire suppression system is designed to use a liquid type fire suppressant to extinguisher cooking fires caused cooking on appliances under nozzles that extend from the range hood. Kitchen fire suppression systems are required to be serviced by a commercial fire protection company semi-annually. In addition to having the kitchen fire suppression system serviced every 6 months, per fire code the hood and duct must be cleaned by a professional hood and duct cleaning company every 3 to 6 months depending on the amount of use. A church with a busy daycare may need hood and duct cleaning every 3 months while a church that only uses the kitchen to cook on Wednesdays and special occasions probably only needs the hood and ducts professionally cleaned every 6 months by a commercial hood and duct cleaning company. Churches also have exit lights and emergency lights which will need to be checked per fire code at least annually. For church fire protection or any of these services please call Fesco Fire Extinguisher & Safety Service Company, LLC, New York, NY, Newark, NJ, Los Angeles, at (347) 912-0836. We give special discounts to churches.